Back in January, I interviewed fantasy author Gregory S. Close. A couple of months later, he had an idea: What if he interviewed me in turn? 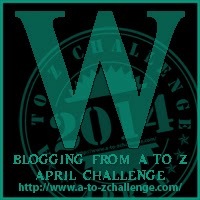 Then I signed up for the April A-to-Z Challenge, and I thought, Hey, my name starts with W! Maybe Greg can do that interview in time for my W post. And that’s why, here and now, W is for Thomas Weaver. Gregory S. Close: When did you first discover that you had a talent for crafting words and sentences, and a grasp for the rules of language? Thomas Weaver: I usually don’t craft words — I prefer to stick with ones that already exist, since that way readers are more likely to know what I’m talking about. All joking aside, I think it’s an intuitive thing for me. I know that there must have been a time when I didn’t know this stuff, but I cannot remember learning it, because I just sort of absorbed it all through reading. Despite having already done some work as a proofreader/editor (in the roleplaying game industry — even the screenplay I edited while in college was for a movie based on an RPG), I didn’t really know that I had a natural knack for it until I started editing for free sometimes on peer-critique sites. GSC: Some claim that editors are all aspiring authors — is this true for you? If so, which came first, and which would you rather be doing as a full-time job, writing or editing? TW: What some people claim is that editors are frustrated or failed authors, people who want to write but lack the ability, creativity, or whatever. I don’t think that’s true, at least not with good editors who love the written word. I was an author for a while — had published stories and everything — before I started editing professionally. If I had to choose (always assuming that I would continue to edit my twin’s novels), I would rather be writing than editing. GSC: Also, if true, tell us a little about your upcoming projects. TW: As always, I’m working on “that novel I’ll finish one of these years.” My clone-sibling had a great idea for how to resolve a problem with that story: how to keep the various plot threads balanced. No surprise that his solution was to split it into two books. (You will be pleased to know, O Loyal Reader, that this means you’ll get to see a lot more of what happened at alpha Centauri, and see it as it happens instead of as characters telling it well after the fact.) You’d think that writing two novels instead of one would be harder, but this is what the story needs, and I’m a lot happier with it this way. I’m also helping my twin with his novels. He’s got one that will be released soon, and another that, hopefully, will be out later this year. Then the third book in the series, the one that has a character from “that novel” as supporting cast… which is why we want to wait until book three is out before doing anything with “that novel.” Intertwining several story lines, across more than one series, is complicated but fun. GSC: What attracts you to a story and draws you in? TW: Characters I can care about. For some reason (and I honestly don’t know why this is), I’m drawn to characters with secrets, the kind of secrets that the reader knows but other people in the story may not. I like complex and unusual settings, multi-thread plots… An interesting narrative voice is also a plus. GSC: Conversely, what drives you nuts and makes you want to toss a MS into the fire? What’s the one thing that will turn you away from a book every time? GSC: In your opinion, what makes a good editor? TW: Not just a grasp of the rules of grammar and such, but also an ability to know when those rules can or should be stretched or even broken. A good editor works toward the author’s intentions for a story, not his/her own. GSC: What is the hardest thing about editing? TW: For me, the most difficult thing about editing is determining what the author intends, both in the specifics and in the story as a whole. When a sentence is unclear, I have to figure out what it’s supposed to mean and change it. When something about the plot doesn’t make sense, or a character seems to be behaving against his or her nature, I have to figure out if that was intentional on the part of the author (and if it works), or if it’s a mistake to be corrected. GSC: What is the easiest thing about editing? TW: Fixing punctuation. Sometimes it’s a lot of work — all those commas and quotation marks and What the hell is going on with the end punctuation here? — but it’s not something that requires as much thought as, say, finding the best synonym for a not-quite-right word or one that has been used too often in a scene. GSC: Since you asked me this, I have to ask you: coffee or tea, and why? TW: I’ve been drinking more tea than coffee lately. Or that chickory-and-roasted-barley imitation-coffee stuff. It mostly depends on my mood, since I’m not drinking it for the caffeine anyway. I still go with real coffee when writing scenes from the PoV of one of the characters from “that novel” (although he’ll be seen mostly in the second part of the story after the split) because he has a coffee habit, and drinking coffee helps me get in the properly paranoid mindset. GSC: How do you go about choosing a project? Is it strictly a fee-for-service, or so you need to feel a connection to the story before agreeing to edit a MS? TW: I won’t edit erotica or religious fiction. I prefer to edit stories that I feel some kind of a connection to, but that isn’t difficult with fantasy and science fiction (except the subset of urban fantasy that borders too closely on paranormal romance — I enjoy a good love-story subplot in whatever I read, but those werewolf-vampire-rutabaga love triangles annoy the hell out of me). If I’m asked to edit a manuscript, and, when I see it, it turns out to look as if a small child flapped his hands on his mom’s computer keyboard (“i dont need help with spelling cos im good at that, just tell me should i have the character find out who is his dad?”), I know that the author-editor relationship cannot work in this case, and I’ll turn down the project. GSC: Do you think of yourself as a partner to the author, or are you just there to polish things up? How much do you engage with the stories, characters, for which you edit? TW: That depends on the project. Some authors don’t want or need more than proofreading and some light line editing, and some want help with major revisions to plot and setting and character. I prefer to work on stories that I can enjoy as a reader, which is why I specialize in science fiction and fantasy. I have edited other kinds of fiction — a cross-genre spy thriller/romance, for example — but it’s harder for me, and I don’t feel that I can do as much to help the author with non-SF/F fiction. GSC: Follow-up to the last question: Is it dangerous to get too involved in the story, or is it a good thing? How do you keep perspective/objectivity if you are enjoying what you’re reading? (In other words, is it easier to edit stuff you like to read, or is it actually harder)? TW: As I said, it’s easier to edit things I like, but I admit that I occasionally find myself getting caught up in what I’m reading and have to go back a few pages just to make sure I didn’t miss anything that needs correcting. On the other hand, any significant errors are going to pull me out of the story no matter how interesting it is (I have difficulty reading novels by certain talented British sci-fi authors because they do weird things with commas and semicolons — I know the rules for punctuation aren’t that different between US and UK English), and if I’m into the story, I am more likely to notice problems such as a character acting out of character. GSC: Should I have put that last question mark inside the parenthetical? (See how handy an editor can be, kids)? TW: Change to Should I have put that last question mark inside the parentheses? (because parenthetical is an adjective, not a noun), and the answer is Yes. GSC: What’s the biggest misconception about editors? TW: Aside from the belief that editors are all failed authors who pick on real authors because of their own inadequacies, I’d say that the biggest misconception about editors is that we’re uptight English-major types obsessed with strict adherence to rules, people whose idea of fun is sitting around memorizing the parts of speech and who disapprove of Eats, Shoots & Leaves because no one should ever make jokes about punctuation. The truth is, editors require a sense of humor. GSC: Why science fiction and fantasy? And do you think the distinction is an important one in any way? I don’t think the distinction between science fiction and fantasy is important most of the time. (I completely reject Card’s ‘Rule of Rivets’ stating that fantasy is always rural and science fiction must have “rivets” and advanced tech everywhere.) I see science fiction and fantasy as part of a spectrum, not an either/or thing. Yes, there are stories that are definitely sci-fi, and there are stories that are definitely fantasy, but there are also a lot of stories that blur the lines. (I’m a Zelazny fan. Do the math.) If I’m editing a story that is intended to be science fiction, and there’s something in it that violates all reasonable extrapolation of current scientific knowledge without some kind of in-story explanation for why it’s different (a.k.a. hand waving), I’ll bring it to the author’s attention and suggest a way to correct the problem. GSC: Do you think that stories, in and of themselves, have cultural value? Or are we all just wasting our time with wild bits of fancy? TW: My twin the anthropologist (and science fiction author) could give you a scholarly answer about how stories are part of what makes us human, probably with quotes from Marvin Harris and everything. All I can say is that I agree with him. Stories are important. We wouldn’t have been making stories for all these thousands of years if there wasn’t some real benefit in doing so. I think there is something essential missing from any person who doesn’t like some kind of fiction, be it books or movies or television or old-fashioned storytelling. GSC: When you are editing, what sort of environment do you prefer? What’s your schedule like? Any particular trick of the trade that works for you — read and edit at the same time, or read first, mull, edit later? TW: The one thing I cannot have when editing is someone walking or standing behind me. I get sensory overload easily, and someone inside my personal space makes it worse; when I’m overloaded, I cannot make decisions such as, Does this sentence need to be broken up into two smaller ones to make sense, or can we get away with using a semicolon? or, Is this scene telegraphing the Big Reveal too soon? As for schedule, I don’t deal well with set schedules for much of anything, which is not the same as saying I don’t deal well with deadlines. I get it done by the time it needs to be done, but no one gets to tell me that I have to edit between the hours of whenever and whenever on certain days of the week, etc. If I wanted that, I’d have a regular day job working for some company, right? I once edited around 30K words of a fantasy novel in one sitting. (Frighteningly, that was only one eighth of the manuscript.) At other times, I’ve done bits here and there throughout the day. Sometimes I read and edit all at once, and sometimes I have to read the manuscript through once to familiarize myself with the story, etc. It helps a lot if I’m familiar with what the author intends with the writing. Answer: Editing my clone-sibling’s novels is great, partly because I get to see the creation of the story through each step along the way. He tells me about what he’s writing, asks my opinion about plot and characters and setting (especially when he’s using something he borrowed from me in the first place 🙂 ). I listen to him when he’s reading the story out loud to make sure the sentences sound right, and I make comments then. This all happens before I ever read the story myself the first time. By the time he’s ready for editing, I’m quite familiar with the story and what he intends it to be. I won’t say we never have disagreement — conflict, even — over writing, but at least the conflicts aren’t because one of us doesn’t “get it” with a plot line or a character. That’s an important thing all the way around: knowing the difference between “This doesn’t work” and “This doesn’t work for me.” By examining why something doesn’t work for one of us, we end up finding something that we both like more, resulting in a better story. This entry was posted in Uncategorized and tagged A-Z Challenge, author interview, editing, writing. Bookmark the permalink. Wow, great interview, and some really great answers! Appreciate your courage in flat-out stating your opinion on topics like violence and religious fiction. (One teeny correction from an editor-minded wannabe writer, though: “editors requires a sense of humor”. Or was that intentional? 😉 ) Hmm, now you have me wondering about smilies-inside-parentheses syntax…. Cat-on-desk can cause even a pro to make typos. (The sentence had originally read “being an editor requires,” and I missed the verb when I changed the sentence because I couldn’t SEE it.) Thanks for finding that, though, so I can fix it. I like how you talk about your twin/clone. I think of the writer in me as a different person, creative and hard to manage. When he’s done with his part, the reader and editor must come out of the closet to look at what the writer has wrought, and make suggestions. And the writer isn’t always happy with that. Terrific interview and post.